Music Center at Indian Hill — EPSTEIN JOSLIN Architects, Inc.
As the new home of Indian Hill Music, the Music Center is set within a choreographed landscape experience, visually separated from the surrounding residential neighborhood, yet closely connected to the agrarian fields and vistas unique to the beauty of the Groton region. The building itself features a 1000-seat concert hall with a door that opens for an additional 1300-seat lawn audience; a 300-seat recital hall; a student recital room; an orchestral rehearsal room; teaching studios and ensemble rooms; dining room/jazz club; and associated performer, administrative, and facilities support spaces. The building is approached via a pedestrian “spine,” flanked by a continuous planted landscape and on axis with one of the two public entries. The southern face of the building embraces the adjoining agricultural landscape with porches and terraces along that edge; and the rear of the concert hall opens and is physically connect to a sloped outdoor performance lawn, allowing audiences to experience concerts while sitting outside. The architectural expression of the building draws upon New England traditions of interconnected farm buildings clad in an assortment of natural materials, such as stone, wood, and metal, composed to reflect the programmatic uses of the building. The structural grid is imagined as an “orchard”—recalling those previously in proximate areas of the site—with stone and wood trunks branching out to support an overhanging canopy at the roof. 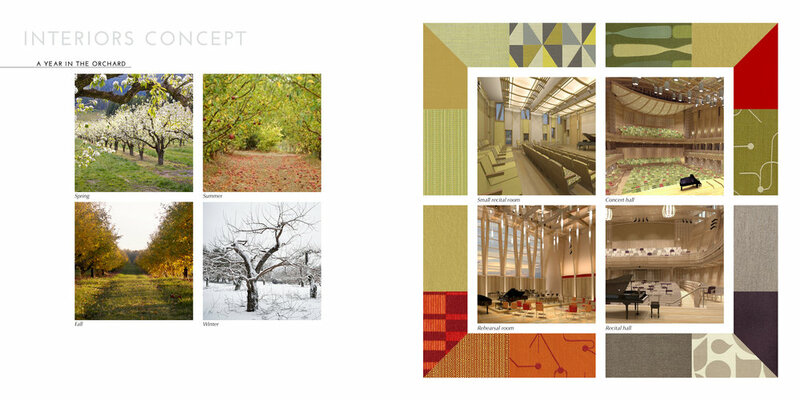 The landscape design for the Music Center is likewise inspired by the existing rural character of the town of Groton and designed specifically to be consistent with both the existing site and the surrounding area. ARCHITECT: Epstein Joslin Architects, Inc. STRUCTURAL ENGINEER: Odeh Engineers, Inc.
CIVIL ENGINEER: Beals Associates, Inc..
FEASIBILITY: Fort Point Associates, Inc.
CIVIL ENGINEERING CONSULTANT: Ducharme & Dillis Civil Design Group, Inc.